“Cow Tom” was born into slavery in the U.S. South in 1810 but he was sold as a child to a Creek Indian chief. Because of his innate ability to pick up on languages he grows to become a valued translator for his chief as different Indian tribes, white settlers, and black men spread west into Creek territory. Because of his translating ability, he is hired by the U.S. military. Such work would earn him some money but more importantly … his freedom. Cow Tom’s grand-daughter, Rose, carries on his legacy as she rises to a position of leadership and continues to face hostility toward the Indians and the Blacks. This is a fascinating time in American history and I enjoy reading fiction (and non-fiction) about this time. This perspective of a black (African-American today) man and woman is certainly under-represented. Author Lalita Tademy seems to have captured what life was very possibly like for a man such as Cow Tom or a woman like Rose. The character of Cow Tom was interesting to me and I was most caught up with what he was doing when he went to Washington to lobby for his (and other Indians’) promised pay – this was one of the few times he was out of his element and actually challenged and this is when we get to see what sort of man he is. Rose and her challenges didn’t interest me so much. It would be hard to have her equal the sort of life and work that Cow Tom has shown, so I don’t really know why we even bother. There was much to like here, but too often I felt that the narrative was a bit choppy. Tademy seems to hit all the big moments that challenged Cow Tom, but she doesn’t quite tie them together smoothly. This is the sort of book in which, while I’m glad to have read it, I wouldn’t be quick to recommend it. Looking for a good book? 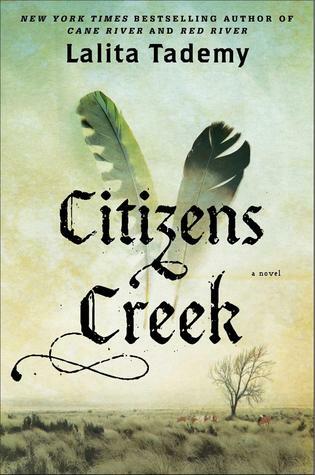 Citizens Creek by Lalita Tademy is interesting historical fiction, but not an engaging read.